I was awoken from my sleep last night by the sound of some massive night beast crashing through the woods near my tent. In the brain fog that accompanies being woken from a sound sleep I didn’t really register what was going on. When it finally dawned on me that “holy crap something is going to eat me!”, I’m not gonna lie I panicked a little bit. My heart started racing and my mind was going over all of the wilderness survival tactics I’d read about over the years. Bear? Play dead. Cougar? Go for the eyes. Wild boar? Climb a tree. So I flipped on my headlamp, which is about as bright as the sun in the 2am darkness, and shine it in the direction of my newest enemy. Nothing. No eyes, no flash of fur or the sharp glint of murderous teeth. Just the forest and a sudden eerie silence. I flip my light off and wait. I hear something like the same sound but much further away this time, so I figure I’m not on the menu tonight and go back to sleep. This was my scenery for most of the day. 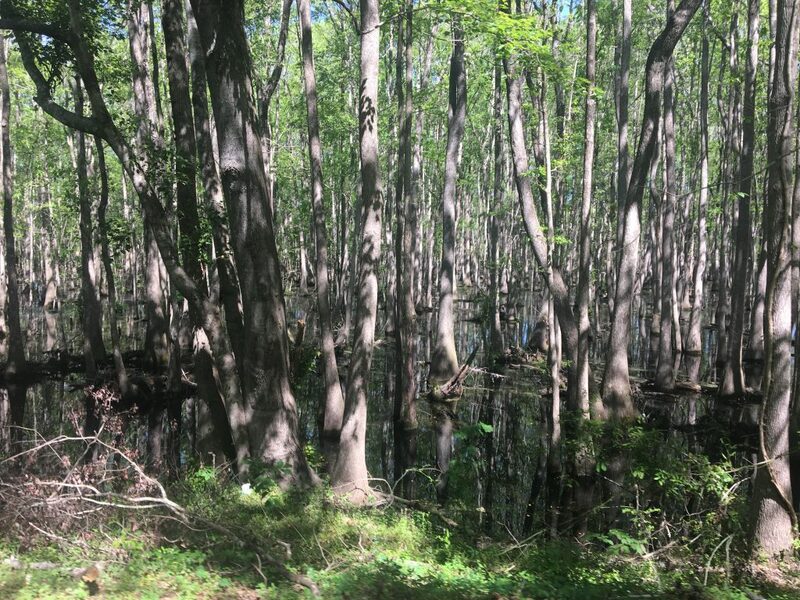 Lot’s of swamps. I’ve only got 26 miles to go at this point so I figure I can take it easy, not go so fast and kind of relax. Hmmm, no. Mother nature had other plans. The wind started to pick up considerably and was coming straight at me. Ugh. Nothing to it but to do it. I drop low on my bars, turn up the music and push on. It really wasn’t that bad but seeing as how I was counting on a nice, leisurely ride it really annoyed me. I got to small town about 7 miles from my home for the evening and decided to stop, take a break and get a snack. The South has a lot going for it but I think that easily the best thing is every single convenience store has a giant jar of pickles for sale at the register. I know I’ve been gushing about pickles a lot but I don’t care. They are the best. 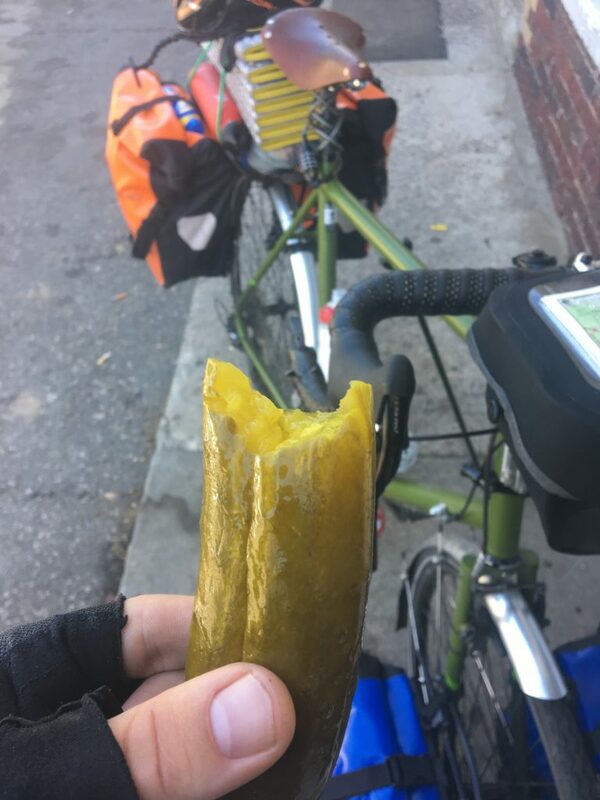 As I’m sitting outside munching on my giant pickle an older gentleman walks up and asks me where I’m heading. I told the first leg of my journey will get me to the Florida Keys. “Florida?!? Son, you white folks are crraazay!” I nearly snorted pickle juice out my nose I was laughing so hard. I can’t even begin to describe the hilarious way he said the word crazy. A good laugh was just what I needed. I push on through the last 7 miles to my campground and when I turn down the road to get there I see something that I’ve been wanting to see ever since I started pedaling. A huge sign with the glorious words WAFFLE HOUSE emblazoned in waffle yellow. I really wasn’t that hungry but I stopped in and had a $7 Grand Slam breakfast anyways. For those of you reading from anywhere but the Southern USA and are confused about this, just know that the Waffle House franchise may be the single greatest thing to come out of America since ever. I devour my breakfast, head to the camp and immediately park myself in their pool for the next hour to cool off my tired muscles. It was heaven. ??? Omg I love it!